Today I am going to share basic concepts for Dice problems from Probability. What is the probability of getting a sum of 4 if two dices are rolled together? What is the probability of getting a sum of 6 if two dices are thrown? Now to find out the probability of a sum when two dices are thrown, there is a shortcut which is based on the diagram below. What is the probability of getting a sum of 5 if two dices are thrown together? 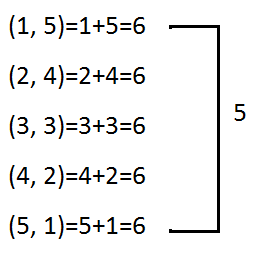 Solution: Observe the picture very carefully we can see if the sum is 5, the probability is 4. So the required probability = 4/36= 1/9. What is the probability of getting a sum of 10 if two dices are thrown together? 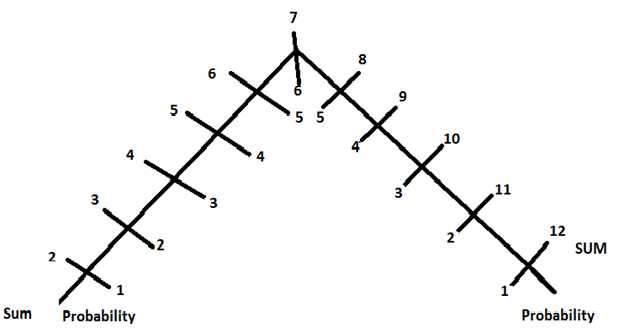 From the picture if the sum is 10, the probability is 3. So the required probability is 3/36 that is 1/12. What is the probability of getting a sum of 6 or 11 if two dices are rolled together? What is the probability of getting a sum of 4 or 12 if two dices are rolled together? So the required probability = 3/36+1/36 =4/36=1/9. what is the good attempt in 30 Min in ibps PO Quant section??? when will SBI announce the prelims results??????? How can i get high score in ibps exam and i need best ibps bank po practice test preparation for crack ibps po exams? Thank you sir!! Could you please share SBI PO Mains practice paper also? Step 1. Type " Ctrl + F"
@Admin Sir, @Ramandeep Singh Sir, square of 122 is mentioned wrong, please correct that. sir, can you provide a paper of rbi assistant 2014 ?? Sir can u tell me about gk part of rbi assistant exam. What to study for this exam? ?